What would it be like to inherit a compass from your parents that always led you home, no matter where you were in the world? Apparently, sea turtles do inherit such a compass, and so do other marine animals such as salmon and whales. They use the earth’s magnetic field to guide them to feeding grounds or mating grounds. What’s even more amazing is that they seem to be born with an internal map to go along with their compass. Salmon, for instance automatically know how to get to the same feeding grounds used by their biological parents even if they were born and raised in a hatchery..
Scientists are finding out that these internal navigation tools are way more sensitive than they thought. They’ve known for a long time that many animals use the earth’s magnetic field to determine their latitude, or north-south position. It’s a fairly straightforward thing to do because it relies on the north-south direction of the earth’s magnetic field, something that never changes. The surprising thing that researchers have recently learned is that sea turtles also use magnetic fields to determine their longitude (east-west position). That’s a trickier job because it’s not about simply knowing the direction of the Earth’s magnetic field; it’s about recognizing very small changes in the strength of it, too. The turtles combine information about magnetic strength and direction to determine where they are in a vast ocean with no other clues or landmarks to guide them. These changes in magnetic strength are so small a regular compass can’t detect them, which means sea turtles are very sensitive to shifts in magnetic fields. That’s important because they travel such long distances that even a small mistake can send them way off course. 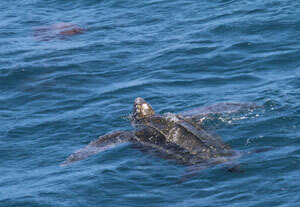 Understanding how sea turtles navigate during their long journeys might help us protect them. It may also lead to improvements in navigation technology, and it could provide clues to why the turtles and other animals such as whales and dolphin sometimes beach themselves.